On the other side people are not ready to believe Congress and their promises. HYDERABAD: At a time when State governments across the country are trying to earn maximum revenue from liquor sales, Telangana unit of BJP, going against the trend, revealed its plans to let wine shops and bars to be open only five days a week and keep liquor shops open only till 6 pm on any given day if the party comes to power in the State. 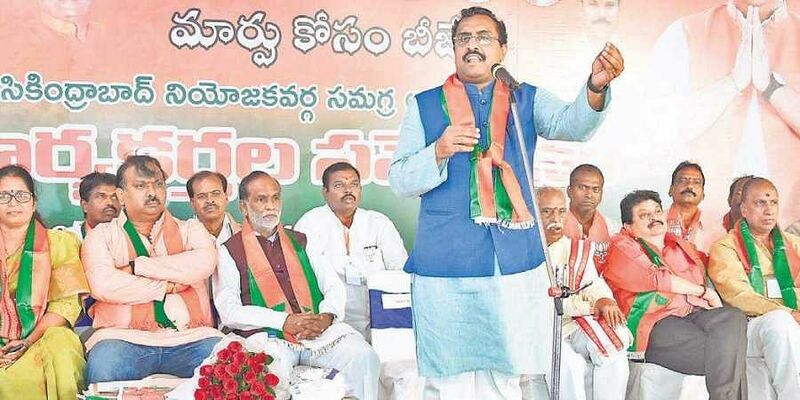 State BJP’s Manifesto Committee, which met in Hyderabad on Saturday, came up with several such suggestions to make the saffron party’s manifesto stand out and to counter plenty promises made by TRS and Congress-led grand alliance parties. Besides its plans on liquor shops and bars, the other major points on BJP’s manifesto also include plans to protect Endowment and Wakf lands, free travel facilities for devotees taking up deekshas as well as creation of jobs for Telangana youth. Speaking to Express, BJP’s Manifesto Committee chief NVSS Prabhakar, said: “Unfortunately the governments which have ruled Telangana till now have seen Excise Department as a revenue generating source. Liquor consumption leads to several ills that are plaguing the society. It also plays havoc with people’s health. BJP wants to regulate liquor consumption and sales. We will allow liquor shops to be open for only five days a week and they should be closed by 6 pm.”Prabhakar further said: “TRS has completely betrayed Telangana people. On the other side people are not ready to believe Congress and their promises. Therefore BJP is planning to come up with a manifesto that will fulfil Telangana people’s aspirations. We will list promises like providing one lakh jobs within three months, free coaching to youth preparing for competitive examinations and providing protected drinking water for just `6 per month. We will also remove VAT on petrol and diesel if voted to power.” NVSS Prabhakar said that BJP would get ready and launch its manifesto on the auspicious day of Vijayadasami.